Whether stuck in traffic or waiting in the ATM queue, checking and rechecking Whatsapp has become a favorite pass time for many in the past couple of years. Almost everyone you know has a Whatsapp account nowadays and you can connect and chat with the person you like doesn't matter where you are or what are you doing. However, according to me the real fun of Whatsapp relies on the various kinds of group chat we all become a part of. These groups provide us an endless source of laughter and whenever you are free you can always find someone online to chat with. And even if you can't find someone online there are always changing funny WhatsApp group names to entertain you which only become more and more humorous as the time goes on. At first, there are groups made of the friends from your neighborhood or colony. Such groups start with not so funny WhatsApp group names such as 'desi boys' or 'boys ka swag', but as the time goes the name of these groups names start getting more funny (and abusive). Then comes a time when you have to hide the names of that group from your whole family. After this, there are groups made of your friends from school or colleges. Consisting both male and female friends, it's a little hard to use the general 'boys' terms(if you know what I mean) in the name of such WhatsApp groups. This often results in the names of these groups staying unchanged for long and they only get updated on the birthdays of any of the participant. Then, there is always a 'My family' group we all have but the irony of such groups are that we ourselves don't know half the people involved in it. These groups often become live calendar for many as their WhatsApp group names always gets changed at the times of any festival. At last, there is a group involving only you and a couple of your closest friends, which is often the most active group among all your WhatsApp groups. These groups involve chats which can easily get you arrested or admitted to a mental hospital if a fourth person finds out about them. We would have mentioned the funny WhatsApp group names of such groups but this is a family post. Regardless of the type of the WhatsApp group, each one of these groups has their own importance and their always changing WhatsApp group names help them to stay fresh doesn't matter whether they are 2 days old or 2 year. 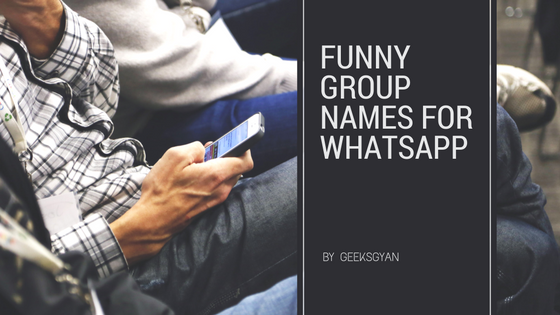 That's why today we have brought to you a list of best funny WhatsApp groups names for all kinds of WhatsApp groups. Whether you are searching for Whatsapp group names for college friends, WhatsApp group names for school friends or looking for a unique group names list, this post will provide you an endless supply for all your future needs of WhatsApp group name ideas. On our Website GeeksGyan You will get all types of Whatsapp tricks and hacks. This is the best collection of Group names,funny whatsapp group names,cool whatsapp group names,funny group names,etc. I hope u like the above large collection of funny whatsapp group names,cool whatsapp group names. so guys dont forget to share this wonderful group names with your loved ones.